Give the World's Greatest Gift to the people you love &hyphen; or just like a whole lot &hyphen; Fuddruckers® Gift Cards. We know you're busy, so we make it quick and convenient. Pick up your gift certificates in any Fuddruckers® restaurant or order them online and we'll ship it to you or your lucky giftee. 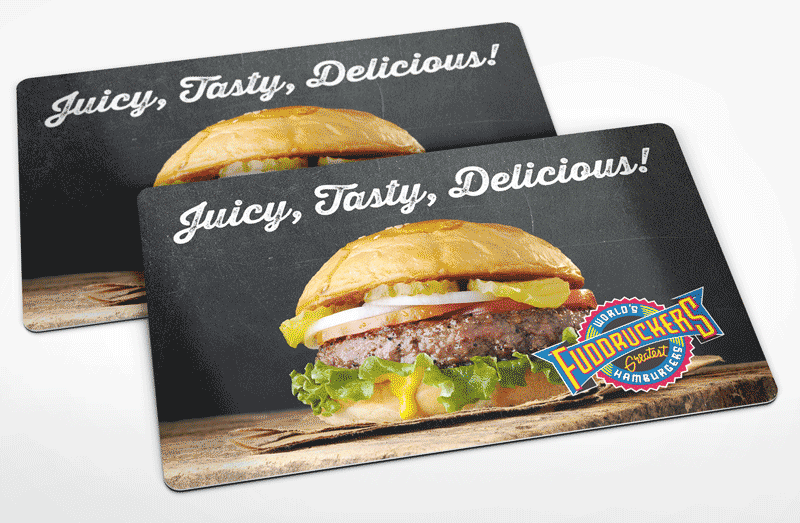 Remember, Fuddruckers® Gift Cards are the tasty way to say Thanks!, Congrats!, Good Luck!, Happy Birthday!, Thinking of You! or We figured you could use a World's Greatest Hamburger™! Or click here to look-up your balance online. Our Gift Card online ordering and Gift Card balance-checking are temporarily unavailable. In the meantime, you can purchase Gift Cards and check Gift Card balances at your local Fuddruckers restaurant. For every $25 you spend on holiday gift cards between November 15 and December 31, 2018, you will receive a $5 reward card valid for use from January 1 through February 28, 2019 at participating Fuddruckers. See card for further details.